Once again the Southern Bloggers Jubilee meet in a fun, tasty location. 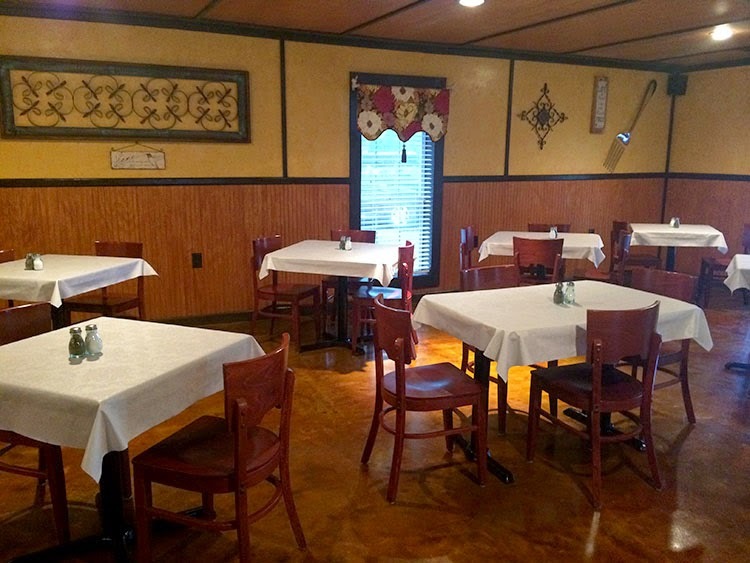 This month it was the newly opened Country Queen Cafe. 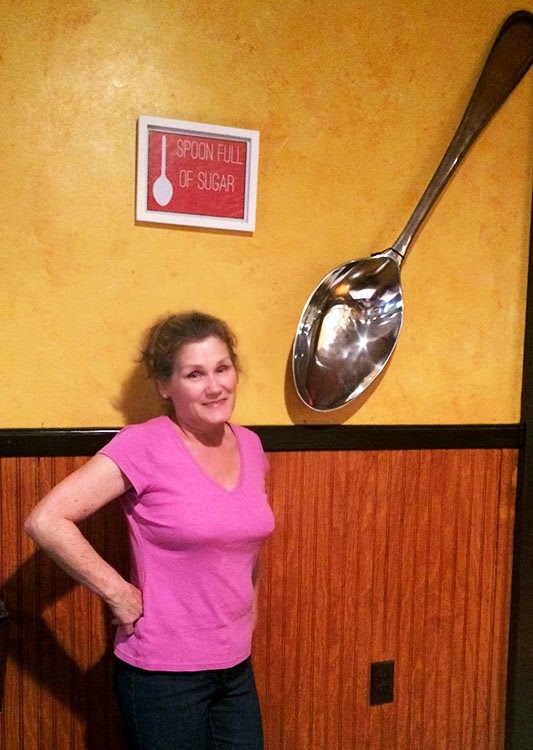 The cafe was a dream of owner Betty Maradik who had previously worked at a small diner in Mobile for several years. She got more room than she asked for when her husband built the place. This is only one side of the dining area. Betty's menu is simple, focusing on breakfast and lunch staples. 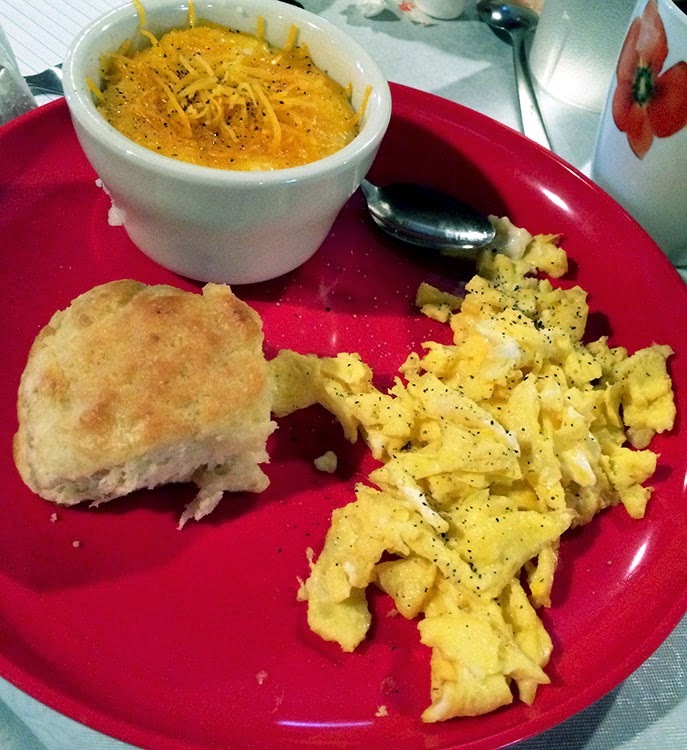 We were there for breakfast, and I got scrambled eggs, a biscuit, cheese grits, and bacon (not pictured). It was delish! 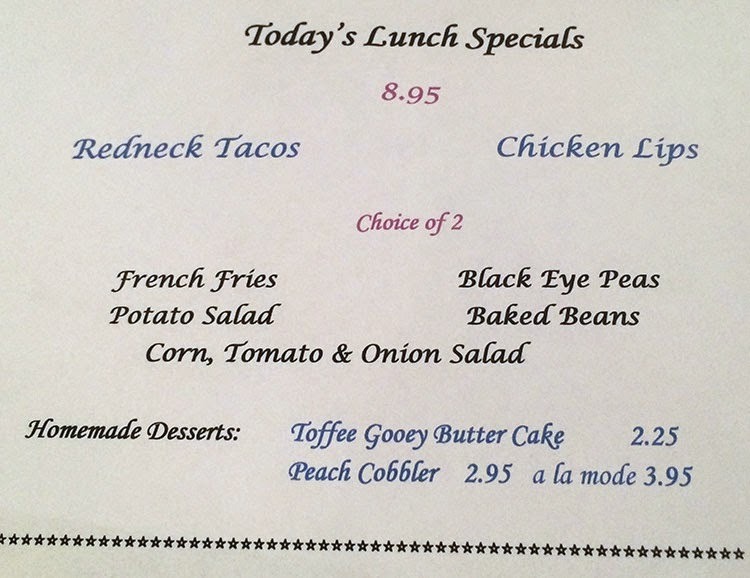 Besides the menu staples, there are lunch specials each day (posted on the Country Queen Cafe Facebook Page at about 10am daily). With specials like these, I almost stayed for lunch too! We were unsure what Chicken Lips were, so Betty gave us a sample before our meeting ended. 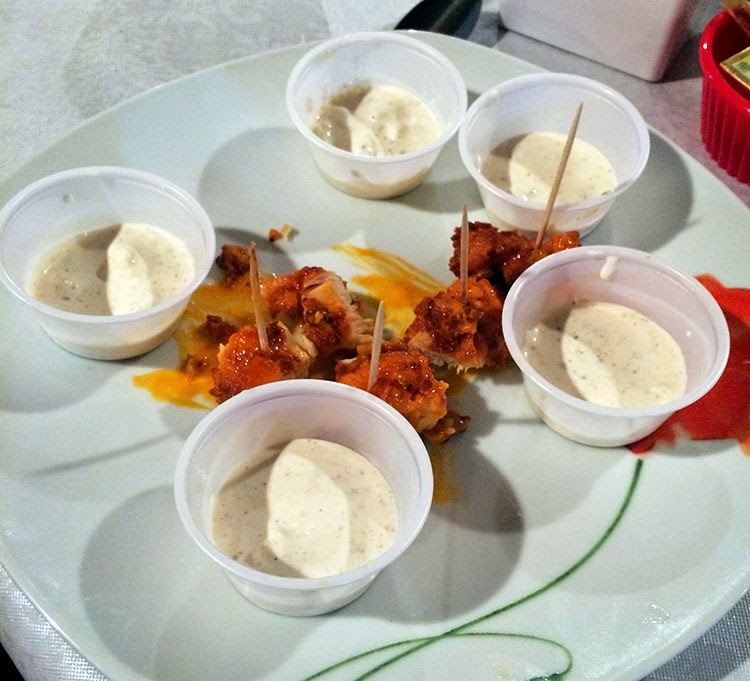 They're lightly battered thin strips of chicken covered in buffalo sauce with a side of blue cheese dressing. They were fab!! Everything about the Country Queen Cafe was rustic, homey, and had me wanting to come back for more! And, with it just up the street from my house. . .I know I'll be back. 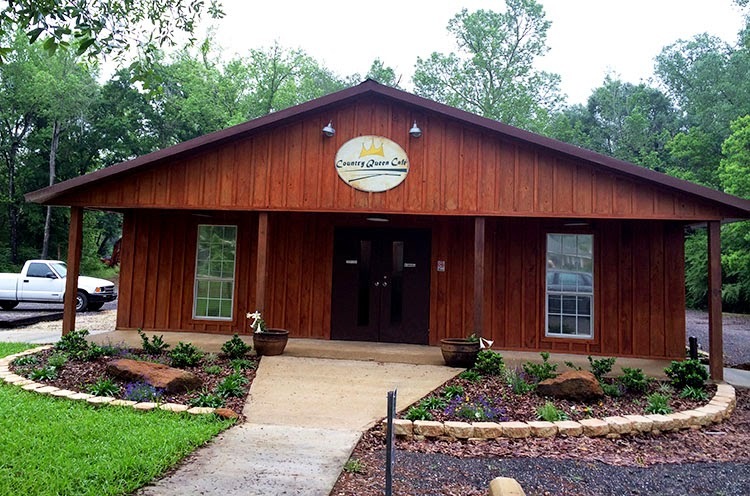 Country Queen Cafe is located at 19548 Booth Rd., Fairhope, AL 36532. Currently they are open 7am-2pm Monday-Friday. However, Betty is considering offering a Sunday Brunch. She also mentioned that catering will soon be available as well as the space being available for events. So much excitement, keep your eye on this little place. It's sure to be a local hit. Sounds delightful...would so check it out if I lived closer! Thanks for the info! Looks cozy and tasty! A great place to meet fellow bloggers! I'm sorry I missed this meeting...looks like a nice place. And that Toffee Gooey Butter Cake on the menu caught my eye!!! Oh yes, I will have to go and try that. And, to you, Betty the County Queen, if you're reading this...I hope it's everything you had imagined and more...from one queen to another. Judy, You were missed for sure. It was a nice, intimate gathering this time though. Oh. . .and if you do see this reply, I went to see your booth yesterday. it's better than I envisioned! Best of luck with it!